From the German black forest to the Andes in South America, this journey recently took a major explosion-protected plant control system. Pepperl+Fuchs created the conceptual design, assembled and fully certified the complex engineered solution and shipped it to the end customer ready-for-commissioning. "This long delivery distance is rather unusual,“ explains Markus Hertel, Head of the European Pepperl+Fuchs Solution Engineering Centers (SEC). One of these is located in Buehl, close to the city of Baden-Baden in the beautiful black forest area. Here the sophisticated control solution came into being, in close cooperation with the constituent from nearby Switzerland. From first project assessment through design and manufacturing to final testing and certification, the project engineers in Buehl worked in continuous contact with the customer. After the successful factory acceptance test, conducted by the customer’s engineers in dedicated laboratories of the SEC, the system left the black forest in appropriate seaworthy crating. In South America the only remaining task will be the termination of the connection cables. "This was the first solution of this kind for that specific customer. Therefore engineering and assembly of the control panel as well as the FAT had been conducted here in Europe, right at the customer’s doorstep. Subsequent orders will be processed in our American SEC in Houston, Texas. The engineering team located there will receive all manufacturing documentation as well as close support from their German colleagues.” Hertel explains the network of Solution Engineering Centers within Pepperl+Fuchs. SECs are established in major industry regions all over the world: Europe, China, India, Australia and America, to name a few. Each SEC has a team of experienced system and application specialists at its disposal. Thus it commands specific expert knowledge on explosion protection as well as on the valid regional and national safety requirements. Furthermore there is competent manufacturing personnel, trained to the stringent quality standards of the Pepperl+Fuchs Group and well versed in the specifics of installing explosion protected equipment. To find the most efficient solution in the maze of safety standards requires in-deep knowledge on explosion protection and respective regulations. On international level explosion protection is standardized in IEC 60079. For the European Union, directive 94/9/EU (ATEX 95) is replaced by directive 2014/34/EU, valid since April 2016. Further conformity assessment schemes are according to IECEx or specific national standards, for instance NEC500 and NEC505 in USA or the ‚Eurasian Conformity‘ (EAC) valid in the customs union Russia/Belarus/Kazakhstan. These standards define types of protection, zone classifications of hazardous areas as well as requirements on installation, maintenance and repair. Most types of protection require special design provisions on equipment and associated apparatus for use in hazardous areas. Among those are ‘increased safety’ Ex e (IEC 60079-7) and ‚intrinsic safety‘ Ex i (IEC 60079-11). Equipment not specifically designed for hazardous areas can be protected by means of ‚pressurized enclosure‘ Ex p (IEC 60079-2) or ‘flameproof enclosure‘ Ex d (IEC 60079-1). Protection against dust ignitions can be achieved by ‘protection by enclosure‘ Ex t (IEC 60079-31). Pepperl+Fuchs offers components and solutions in all mentioned types of protection. 'Intrinsic safety‘ Ex i allows to maintain or exchange field devices and signal transmission components during operation. By limiting the power in each electrical circuit a possible arc or spark is kept below the ignition energy of the surrounding gas atmosphere. The consequence, however, is limited energy to feed loop-powered devices. For Ex i signal transfer several technologies are available, such as digital fieldbus communication, Remote I/O systems or conventional isolated barriers. More power can be transmitted via ‚Increased safety‘ Ex e, for instance for supply of lighting or power distribution networks. Maintenance typically is not possible during operation, a 'hot work permit‘ is required. Components or systems not designed according to Ex e, Ex i or any other type of protection which prevents the occurrence of sparks, have to be safely protected when used in hazardous areas. There are two options. ‚Pressurization‘ Ex p contains the potential ignition sources inside an appropriate enclosure and keeps any explosive gas mixture on the outside by means of overpressure. A continuous flow of inert gas has to be guaranteed by reliable control and monitoring methods. ‘Flameproof’ Ex d, in contrast, contains a possible explosion inside sturdy enclosures without the need of active control elements and pumps. Suitably designed flame paths prevent the egression of the flame. Furthermore the outer surface of the enclosure must never reach the ignition temperature of the surrounding gas atmosphere. Adherence to the relevant equipment standards, be it for Ex p or Ex d, is ensured by the project engineers in the SECs. Once in operation the user has to consider the regulations regarding testing, commissioning and maintenance of electrical installations in hazardous areas. These are defined in IEC 60079-14 and -17. Especially with Ex d special care is mandatory when working on the enclosure or closing the enclosure cover. 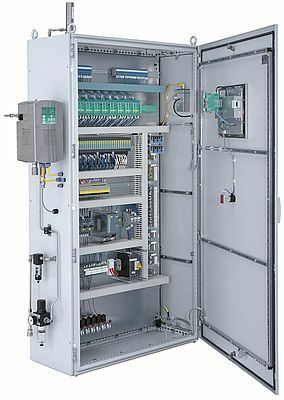 In order to minimize the need to open an Ex d enclosure a combination with a connection chamber in Ex e is convenient. 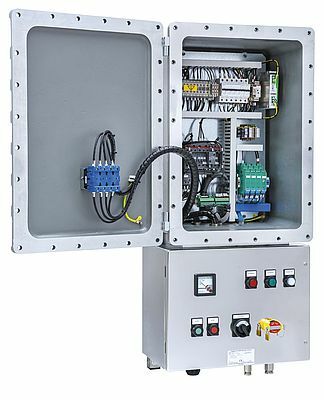 Both enclosures are mechanically connected by a particular flange, specific line bushings are utilized for cable entry into the Ex d compartment. With Pepperl+Fuchs, the Ex e enclosures as well as the flange are manufactured from high-quality stainless steel. The flange ensures the explosion protection of the enclosure and prevents dirt agglomeration and ingression of moisture. In addition to a wide selection of cable glands and terminals in ‚increased safety‘, the operating elements from the FXLCS series of control stations can be integrated. This offers a multitude of control functions including the option to modify or enhance them at a later point in time. 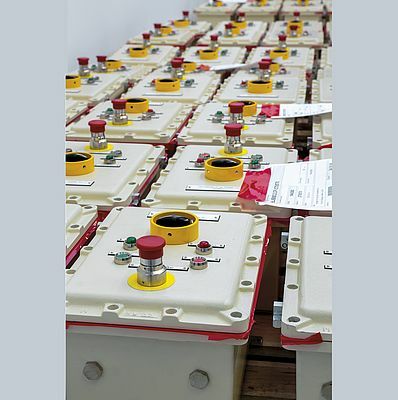 Flameproof Ex d enclosures are available in stainless steel, aluminum and cast iron, for diverse gas groups and in many sizes. In close cooperation project engineer and customer will derive the most efficient enclosure combination for the specific application. A skillful allocation of functions to type of protection as well as adequate positioning of the components in the Ex d compartment ensures efficient space utilization and thus optimized capital expenditure.